According to a new market report on the magneto elastic torque sensor market, published by Transparency Market Research the global magneto elastic torque sensor market is expected to reach US$ 225.68 Mn by 2026, expanding at a CAGR of 9.9% from 2018 to 2026. Asia Pacific will continue to be at the forefront of global demand, with the market in the region growing at a CAGR of 11.6% through 2026. The rising importance of torque testing in the assembly of safety-related components and equipment is expected to offer a huge boost for the demand for torque sensors. The market will also get a shot in the arm with the rapid expansion of aircraft fleet. With larger numbers of aircrafts being manufactured, a corresponding rise in the sales of torque sensorsis expected during the forecast period. The sensors role in continuously monitoring and measuring helicopter powertrain monitoring systems and control application will also stand in good stead, as these machines are the primary modes of transport to and from offshore oil rigs and other remote oil fields. With diminishing supplies of fuel forcing fuel companies to drill in more distant areas, torque sensor companies have managed to find a vast market in aerospace as an end-user sector. The global magneto elastic torque sensor market has been broadly segmented in terms of application and geography. In terms of revenue, the automotive segment has the highest market share and this segment is anticipated to maintain its position during the forecast period and witness a CAGR of above 10%. Automotive is currently the largest application segment of magneto elastic torque sensors due to thewide range of applications such as dynamometers, steering systems, transmission, chassis performance, and driveline. Recently, magneto elastic torque sensors have made their way into racing cars and are used by a number of Formula 1 teams. Many more automotive applications have emerged during the last few years with numerous technological advancements and continuous demand for precise and accurate torque measurement. By region, Asia Pacific dominated the magneto elastic torque sensor market in 2018 with China contributing majority share. Continuous growth in the production of light vehicles in Asia Pacific plays a huge role in the growth of the magneto elastic torque sensor market. In North America, the United States is the largest market mainly connected to automobiles sales, which increases the overall demand for magneto elastic torque sensors. Apart from North America, Europe is also expected to contribute significantly to the global magneto elastic torque sensor market. The magneto elastic torque sensor market in Europe is expected to expand at a CAGR of 10.6% during the forecast period. Europe is a major center for Formula 1 racing, which is currently one of the largest application areas for magneto elastic torque sensors. The research study includes profiles of leading companies operating in the global magneto elastic torque sensor market. Market players have been profiled in terms of attributes such as company overview, financial overview, business strategies, and recent developments. 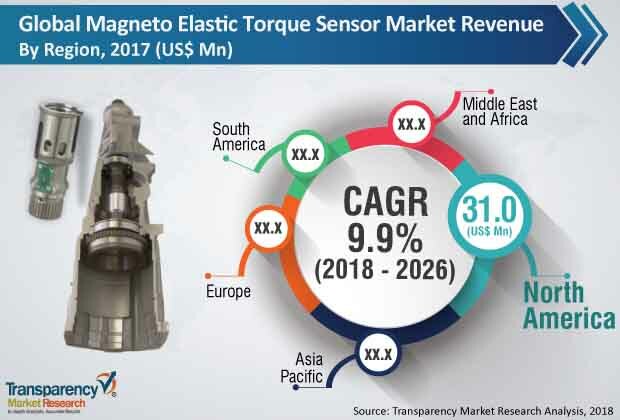 Key players in themagneto elastic torque sensor market are ABB Ltd, Applied Measurements Ltd., Crane Electronics Ltd, Honeywell Sensing and Control, HITEC Sensor Developments, Inc., Kistler Instrumente AG, MagCanica, Methode Electronics, and Texas Instruments, Inc.among others. Companies are focusing on expanding their business through strategic acquisitions and partnerships with several end-use industries.